The former Manhattan Beach space of Mr. Cecil's California Ribs has been transformed into The Rockefeller, a second branch of the Hermosa Beach gastropub. The Rockefeller, 1209 Highland Ave., Manhattan Beach, CA 90266, 310-372-8467. The second California location of Bonefish Grill --- the inaugural site was in Orange County --- has opened in the Valley’s Northridge Fashion Center. The restaurant, serving lunch and dinner daily and brunch on Sundays, showcases hand-cut, seasonal, local and globally sourced seafood. Appetizers include "Bang Bang Shrimp" with spicy sauce, ahi tuna sashimi and edamame hummus. Fish entrées, hand-cut daily, feature Pacific salmon and swordfish, tilapia and mahi mahi; steaks, pastas, chicken and pork are also offered. Cocktails, craft beers and 30 wines by the glass are available. Lunch & Dinner daily, Brunch Sun. Bonefish Grill, Northridge Fashion Center, 9301 Tampa Ave., Northridge, CA 91324, 818-998-3430. Chef Michael Mina’s fifth Bourbon Steak location is slated to open in Glendale at the Americana at Brand outdoor mall in spring 2014. Bourbon Steak, The Americana at Brand, 889 American Way, Glendale, CA 91210, no phone. Satdha, a new “plant-based” Thai eatery in Santa Monica from chef Gunn Pankum (Bulan) offers innovative vegetarian fare like beet-dyed noodles (beet-infused rice vermicelli with coconut, shallots, baked tofu, bean sprouts and fermented black beans) and chard leaves stuffed with coconut, shitake, lime, cashews and ginger. The restaurant will soon feature a biodynamic wine list. Lunch & Dinner Tues.-Sun. Satdha, 2218 Lincoln Blvd., Los Angeles, CA 90405, 310-450-6999. Austin native Briana Valdez brings a taste of Tex-Mex to Los Feliz at her new breakfast and lunch spot on Hollywood Boulevard, HomeState. Consulting chef Alex Ageneau (Patina, The Royce) has helped Valdex put together a menu of Texas favorites including breakfast tacos with applewood-smoked bacon and farmers' market eggs, migas, brisket and pulled chicken sandwiches, chicken fried steak tacos and Frito pie in a bag. Breakfast & Lunch daily. HomeState, 4624 Hollywood Blvd., Los Angeles, CA 90027, 323-666-1633. Jimmy Shaw is opening his sixth Loteria Grill at FIGat7th, and with his brother Andy Shaw, an adjacent torteria (sandwich shop) stall called Torta Co. Expect regional Mexican specialties found at the other Loterias, and at the torta shop, Mexican-style sandwiches the likes of turkey mole, pulled pork, spicy wild mushroom, and red snapper. Lunch & Dinner daily. Torta Co. and Loteria Grill, 735 S. Figueroa St., Los Angeles, CA 90017, 213-435-6782. Plan Check Kitchen + Bar has opened its second location, serving modern takes on American comfort food by executive chef/partner Ernesto Uchimura. Mixologist Matt Biancaniello (Library Bar) serves up premium whiskeys, craft beers and innovative crop-to-cup cocktails. Expect Uchimura’s signature items like the Plan Check burger and smokey fried chicken, as well as new dishes including a salmon pastrami, made with green peppercorns, inky cream cheese and brined celery on an everything bagel chip. Plan Check Fairfax will also offer a new late-night bite menu --- available nightly during the last two hours of service --- featuring three to four rotating items such as pastrami poutine, comprised of beef tallow French fries, pastrami bits, pastrami gravy, melted Swiss cheese and chopped pickles. Lunch & Dinner daily. 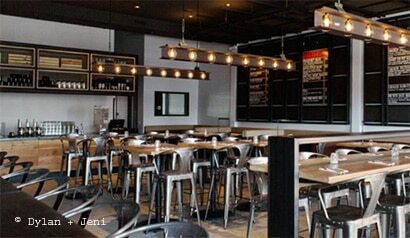 Plan Check Kitchen + Bar, 351 N. Fairfax Ave., Los Angeles, CA 90036, 310-288-6500. Chef/owner Jeffrey Saad, a finalist on The Next Food Network Star in 2009, and host of the Cooking Channel’s United Tastes of America, has taken over the long-running Out Take Bistro space in Studio City, transforming it into La Ventura. The menu features contemporary Mexican dishes like coconut milk ceviche, crispy calamari tacos with habanero-pineapple salsa, and duck confit mole, as well as carne asada and whole roasted fish. A full bar was inherited, now turning out blackberry margaritas and ginger mojitos. Lunch and dinner are served daily. Lunch & Dinner daily. La Ventura, 11929 Ventura Blvd., Studio City, CA 91604, 818-358-3423. The Wallace, under the direction of chef and co-owner Michael Teich, has opened in Culver City with a menu emphasizing local, sustainable sourcing. Starters include chicken liver mousse with balsamic onions, duck rillettes, and wild mushroom ragoût on crispy polenta, while the menu features entrées like grilled Greek octopus with salsa verde, Skuna Bay salmon with parsnips, and duck confit with hoisin barbecue sauce. Cocktails, craft beers and boutique wines are offered. Dinner nightly. The Wallace, 3833 Main St., Culver City, CA 90232, 310-202-6400. Chef Roy Choi will be opening a new restaurant, POT, in K-Town hotel The Line Los Angeles. Expect Korean food stylings crafted through Choi’s personal gastronomic lens, including hot pots, soups and barbecue. Additional eateries Choi will be heading up at the hotel include a lobby bar, a café/bakery and poolside commissary that focuses on breakfasts, salads and fresh juices. POT, The Line, 3515 Wilshire Blvd., Los Angeles, CA 90010, 213-381-7411. Hollywood’s L’Scorpion tequila bar has a clubby new sister spot in WeHo, L'Scorpion West. Amid a loungy cabana enjoy the likes of masa-crusted oysters, sweet and spicy wings, charred pepper ahi, and stuffed chiles with quinoa. The newly popular brunch offers lobster crêpes and Bloody Marys. L'Scorpion West, 8512 Santa Monica Blvd., West Hollywood, CA 90069, 310-855-0055. Scopa Italian Roots teams up mixologists Steve Livigni and Pablo Moix (La Descarga, Harvard & Stone) with the folks behind Black Market Liquor Bar, including Mario Guddemi, Sal Aurora and chef Antonia Lofaso. Besides the high-end craft cocktails and an ambitious wine program, expect a host of Italian small plates like ricotta crostini, fried cauliflower and cardoon, a crudo menu, pastas, salads and bigger entrées including a whole sea bream. Dinner nightly. Celestino Drago’s Osteria Drago has closed, but Al Bacio Ristorante has nearly seamlessly replaced it, helmed by chef Christian Simianato (Andrea, The Resort at Pelican Hill.) Expect an Italian menu featuring crispy octopus with canellini beans and thyme, bucatini with pork cheek amatriciana sauce and baked ricotta, porcini mushroom risotto, and Mediterranean sea bass with braised fennel. Al Bacio Ristorante, 8741 Sunset Blvd., West Hollywood, CA 90069, 310-657-1182. Santa Monica’s Bamboo Izakaya has been transformed into 41 Ocean Restaurant. While the adjacent Club 41 Ocean is for members only, the restaurant is open to the public. 41 Ocean Restaurant, 1541 Ocean Ave., Santa Monica, CA 90401, 310-879-4141. Chef Michael Fiorelli, most recently of mar'sel, is partnering with Cafe Pierre owners Guy Gabriele and his daughter, Sylvie, on a new Italian restaurant. (The name has yet to be announced.) It will open in the current space of Cafe Pierre, which will close in Spring 2014 after being in business for more than 30 years. During Fiorelli's tenure at mar'sel at Terranea Resort, the restaurant was honored on GAYOT's lists of the Los Angeles area's Top 10 Romantic Restaurants, Top 10 Restaurants with a View, Top 10 Outdoor Dining Restaurants and Top 10 Restaurants for California Cuisine. Cafe Pierre, 317 Manhattan Beach Blvd., Manhattan Beach, CA 90266, 310-545-5252. 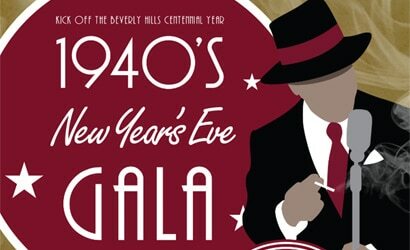 On New Year's Eve, Montage Beverly Hills presents a 1940s gala in the Marquesa Ballroom. In addition to an open bar and midnight Champagne toast, guests will enjoy a five-course menu with dishes like lobster thermidor "Prince de Monaco," filet Oscar and a classic banana split. The event starts at 8 p.m. and costs $345 per person, including valet parking. (Price excludes tax and gratuity.) For reservations, call 877-935-7099. Montage Beverly Hills, 225 N. Canon Dr., Beverly Hills, CA 90210, 310-860-7800, 888-860-0788. Chef Ricardo Zarate (Mo-Chica, Picca, Paiche) has branched out beyond the Los Angeles area with Blue Tavern in Santa Barbara. This restaurant at the Hotel Indigo Santa Barbara at the State House features a Peruvian spin on California cuisine. Blue Tavern, Hotel Indigo Santa Barbara at the State House, 121 State St., Santa Barbara, CA 93101, 805-845-0989. Pastry chef Sherry Yard, who left Spago Beverly Hills in early 2013, will open her own version of Helms Bakery in the historic Culver City space. The project is a partnership with chef Sang Yoon (Lukshon, Father's Office). Helms Bakery, 8800 Venice Blvd., Culver City, CA 90034, no phone. UMAMIcatessen --- an ambitious concept from Adam Fleischman that combined his Umami Burger with PIGG, a pork-centric menu from prominent San Francisco chef Chris Cosentino, along with a kosher-style deli --- has been rebranded as Umami Broadway (basically the usual Umami menu) after a nearly two-year run downtown. UMAMIcatessen, 842 S. Broadway, Los Angeles, CA 90014, 213-413-8626. Susan Feniger's STREET has been replaced by Mud Hen Tavern, a gastropub concept from Susan Feniger and Kajsa Alger. Susan Feniger's STREET, 742 N. Highland Ave., Los Angeles, CA 90038, no phone. Pasadena’s Smith Brothers Restaurants (Parkway Grill, Arroyo Chop House) is once again tweaking its Lake Avenue venue known as Café 140 South, originally a Crocodile Café, and will rebrand it as Seco, a New American eatery, in the coming weeks. Lunch & Dinner daily. Seco, 140 S. Lake Ave., Pasadena, CA 91101, 626-449-9900. Silver Lake residents are sad to say goodbye to Dusty’s, a favorite neighborhood spot on Sunset. Dusty's, 3200 W. Sunset Blvd., Los Angeles, CA 90026, no phone. Celestino Drago’s Osteria Drago has closed and has been replaced by Al Bacio Ristorante. Osteria Drago, 8741 Sunset Blvd., West Hollywood, CA 90069, no phone.